Wilfrid R. Addey (1912-1999) worked as a commercial artist for over sixty years, working for Dorland Advertising and Mitchells among other London advertising firms. His work shows the range of products and illustration styles, from aeroplanes and cars, beer and perfume, to satirical cartoons and calendar pin-up girls and is representative of the post war boom in advertising during the late 1940s and 1950s. 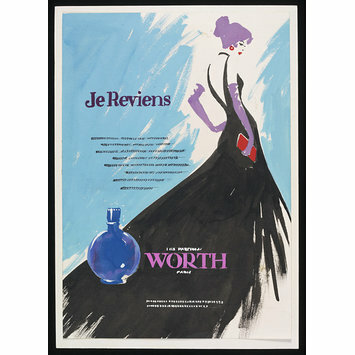 This gouache drawing is one of four designs made by Addey for an advertisment for the perfume Je Reviens from Worth. This design shows a woman in a long black evening dress and purple gloves walking to the right with her back to us. The bottle of perfume is shown in the bottom left corner underneath the name of the perfume and a piece of text. The rich combination of purple and blues creates a luxurious composition to advertise the commodity of perfume. 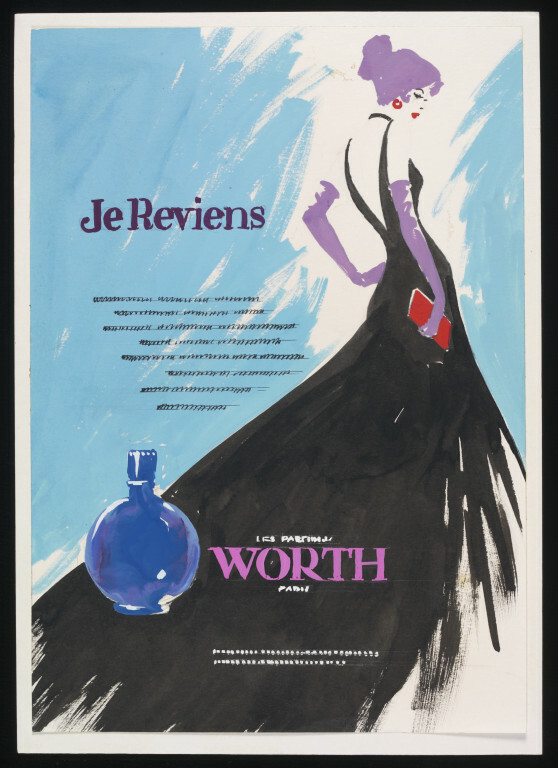 Gouache design for an advert for Je Reviens perfume from Worth showing a woman in a long black evening dress and purple gloves walking to the right with her back to us. The bottle of perfume is shown in the bottom left corner underneath the name of the perfume and a piece of text.